Early bird New Yorkers on their way to work Monday morning where greeted with the shocking disregard for human life when an assailant gunned down three individuals on the steps of a Penn Station stairwell entrance, at the corner of 35th and 8th ave, a few doors down from a McDonald’s store where the party had momentarily left. The shooting which happened just before 6.15 am according to cops began after a ‘a heavy set man in a black hoodie’ came over and picked a fight with the trio who had just arrived at the venue known as Junkie McDonald’s because of the vast amount of methadone addicts who normally congregate there after picking up their normal morning hour pick me at nearby West Midtown Medical Group methadone clinic. As the trio left the fast food venue, the unidentified assailant followed them into the station and shot them each at point-blank range with a 9mm pistol. 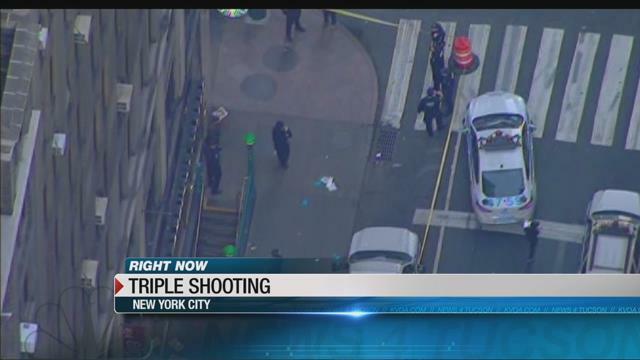 Killed according to a report via the nypost was 43 year old Angel Quinones who was shot in the neck, while two other individuals, critically injured where taken to Bellevue Hospital Center. According to law enforcements, pal, William Lamboy, 45, was shot in the neck and abdomen, while Eddie Torres, 48, was hit in the leg. Of question is if all three men were necessarily enrolled at the nearby clinic and whether in fact they necessarily knew each other or the assailant for that matter. Also of question is what may necessarily have led to the dispute escalating outside of the McDonald’s venue? Shortly after the shooting, three men, including the shooter were observed fleeing in a silver car. Addressing attending press corps, Chief of Detectives Robert Boyce said the shooting ‘doesn’t’ look like it has anything to do with the methadone clinic from which the victims had momentarily left from before arriving at the McDonald’s store. Thanks to its proximity to the methadone clinic, the fast food venue is a notorious haven for drug addicts. A recent New York Times report called the location ‘junkie McDonald’s’ in which users are often observed drinking alcohol and passing out at the venue. 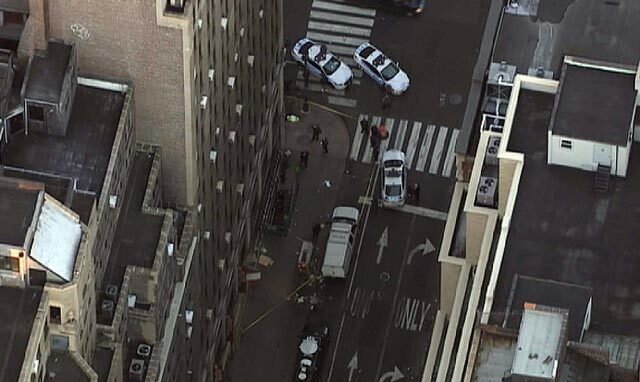 The intersection where the shooting happened is one block north of where the A, C and E subway lines converge at Penn Station. Police have closed several streets surrounding the area. At least two bus routes, M20 and M34A, are being detoured as police continue to investigate the triple shooting.